The subject of today’s Friday sermon was derived from a sermon of Hazrat Musleh Maud (may Allah be pleased with him) on communal flaws and shortcomings. Shortcomings are of two kinds, individual and communal just as good qualities are also both individual and communal. It should be remembered that flaws and shortcomings develop due to the influence of the environment. Just as seed cannot germinate without soil and even if it did it would wither away very soon, shortcomings and virtues which are borne of flaws and good qualities are influenced by environment, making environmental factors a necessary element. Environments are also of two types; one kind only affects individuals and does not influence everyone in a community. For example lands in specific areas are specifically good for growing certain crops. Like there are areas in Pakistan where fragrant Basmati rice is grown and which cannot be replicated elsewhere. Virtue or evil also develop due to specific situations on communal level and results in rise or fall of nations. Individuals can improve and progress through effort but an individual’s effort cannot impact communal good or evil. An individual is only an element of a community and a communal shortcoming cannot be rectified by reformation of just one element. If swallowed toxin will impact one’s entire body adversely just as good, wholesome food impacts one’s body in a positive way. Thus communal virtue or communal evil impacts the entire community. A whole certainly impacts all its elements and the principle is that benefit or loss to a whole is beneficial or adverse for every element. An individual can correct himself but the entire community needs to reflect and make effort for communal reformation. While it is important for each individual to self-reflect it is also important to reflect on communal shortcomings and rectify them. There can be no success without collective remedy! Governments make efforts to avoid loss from natural disasters etc. And where governments do not take action, as it was in last summer’s floods in Pakistan, people suffer greatly. If governments do not take precautionary measures and are not conscientious, communal loss can intensify. Hazrat Musleh Maud (may Allah be pleased with him) said that with reference to Ahmadiyya Jama’at it can be beneficial if the Jama’at reflects over nation’s shortcomings and remedies them. Harmful innovations in religion can spread badness and erroneous beliefs influence everyone and this can also negatively impact culture. However, we are Muslim and consider the Holy Qur’an to be Word of God and believe its teachings to be flawless. Indeed, flawless teachings do not have adverse impact. So, are all Muslims free from badness? Generally speaking most Muslims are embroiled in badness. This is indeed worth reflecting over in light of the fact that the Holy Qur’an is free from any flaw and has brought the perfect religious law. Much of what the Holy Qur’an states has come to pass and God’s declaration that its teaching is free of flaw is also truthful. Question arises, where does the deficiency lie? It is of course in understanding the teaching incorrectly and in practicing it incorrectly. These errors may have crept in by the erroneous understanding of religious scholars past and present. These scholars have their points of view but the nation follows them blindly even though some among them are highly educated. And thus shortcomings and flaws crept into communities, environment had its effect, adverse effect of cultures of other religions was taken and cultural aspects were deemed religious aspects! We are fortunate to belong to the Jama’at of the Promised Messiah (on whom be peace) and traditions which are devoid of any wisdom should not have any impact on us. However, we too are not completely safe. People with different viewpoints enter the Jama’at and some newcomer scholars interpret matters according to their own mind-set. Of course it is not forbidden to do so; however, there are some principles which need to be followed in this regard. In order to avoid promoting any erroneous concept scholars should express their views in subordination of Khilafat. With the grace of God our Jama’at is generally free from such issues but there is need to be constantly aware of this. We should reflect and see what communal shortcomings do people of other faiths or those of no faith have. Physical distances have decreased in the world and good qualities and shortcomings of all can be seen clearly and indeed have impact on each other. Our environment definitely affects us. Parents may impart their own values to their children but environment also affects and children spend a large part of their day at school and at home too ‘friends’ can be made through other means who can have negative impact on children and adults alike. Children do not listen to parents and some parents react badly and are oppressive to the children and this leads to children losing respects for parents. These shortcomings and flaws do not remain individual flaws, they become communal ills and homes are broken. Parents kill their children spiritually as well as physically. Some Ahmadis are also being influenced by the communal ills of the Western world. Before these shortcomings affect us any further we need to heighten our efforts to rectify them. All parts of Jama’at Ahmadiyya should think collectively and plan to eradicate these ills right away before the ills of the Western world creep into us as communal ills. We have pledged and declared to remedy the world of its ills. How could this be if the very people who are to cure become afflicted! In general our Jama’at has mosques and centres all over the world but there are some areas where there are only a few Ahmadi homes and instead of offering their Salat together Ahmadis offer it at home. This happens because some are busy while other combine their Salat due to hectic work schedule. There is not much focus on congregational Salat and there is too much inclination to combine Salat. As if these aspects are becoming our communal shortcomings. There is a critical need to remedy this. This flaw is not individual based but is heading towards becoming a communal failing and shortcoming. Significance of congregational Salat has declined. Although Ahmadis offer their Salat at home with deep tenderness and humility which perhaps other Muslims do not but other Muslims are very regular in going to mosque even if they do it for pretence. And of course once in the mosques they utter nonsense about the Jama’at which is creating ills among them whereas our objective to go to the mosque is to remove our ills. We need to pay attention that mosques are filled and populated by true believers. Not offering Salat in mosque or combing Salat becomes that much more perilous on a communal level when we note that children are losing the significance of congregational Salat and some even say that Salat is offered three times a day (due to combing). Urgent reflection and planning is required everywhere in this regard otherwise this could become a communal ill for our next generation! And one ill leads to another and faith remains all but in name with its spirit lost. There is great need to make endeavours to avoid spiritual illness. Those who take precautionary measures remain somewhat safe from apparent ills. Thus, we need to take precautionary measures. After reforming ourselves we need to constantly safeguard against such ills. We should ponder on the areas where ills have entered in the lives of other Muslims and they have lost the way. We should not go with the flow; in fact we should mould situations to suit us. 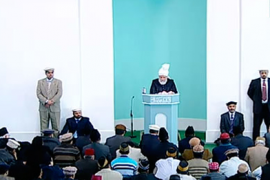 We need to remain connected with Khilafat and also need to keep in touch with MTA and our website alislam.org. They provide us the true teachings. It is worth remembering the Muslims were given a Book like the Holy Qur’an yet they have so many ills and shortcomings. Most of all the source of their communal ill was that the Holy Qur’an is pure guidance from cover to cover. On the face of it here it seems that a good quality is being cited as a flaw. Indeed, due to their misunderstanding of the Holy Qur’an Muslims developed a great shortcoming. There is no doubt that the Holy Qur’an is a perfect Book and will be a source of guidance till the Day of Judgement. Indeed, there is also no doubt that God Who is the Creator of the human mind knew that if the mind is not trained to think it loses its functions and loses its capacity to develop. Therefore, although God made the Holy Qur’an flawless and perfect, He left one part of each commandment therein for the human mind to work out. Some of its principles are clear and decisive while other aspects need human mind to reflect and think so that the human mind does not become redundant. The Holy Qur’an has been revealed in words and phraseology which promote deliberation which in turn results in unfolding of knowledge. If this was not so the Holy Qur’an would have been clear to understand for all without any reflection. The Divine Will behind this was not to let the human mind become redundant and stunted. However, there are some rules and regulations, some principles regarding this. In this age the Promised Messiah (on whom be peace) has guided us about them and has given us his own interpretations and commentaries which should always be kept in view. And those who wish to look for new points in the Holy Qur’an should do so in line with the Promised Messiah’s (on whom be peace) guidance. The Holy Qur’an is a perfect Book and it has everything in it but only those are granted guidance from it who read it, reflect over it and try and put it in practice. It informs us of individual and communal ills as well as good qualities. For the teaching of people of the latter days and to widen their thoughts and to show them light and understand the Qur’an, God has declared in it that He would send His chosen person in latter days. However, those who do not reflect on it have rejected the one sent by God and are thus deprived of the expansive knowledge of the Qur’an. They are lost in ignorance and bring Islam in disrepute. Such acts of other Muslims should spur us even more to not only look at what is apparent but while understanding the spirit of Islamic teachings we should eradicate every ill before it becomes communal. Two present funeral Prayers and two in absentia were announced. The present were: Razia Mussarat Sahiba and Amir Shiraz Sahib. Funeral Prayers in absentia were for Al Haaj Rasheed Ahmad Sahib of Milwaukee, USA and Hassan Abdullah Sahib of Detroit, USA.